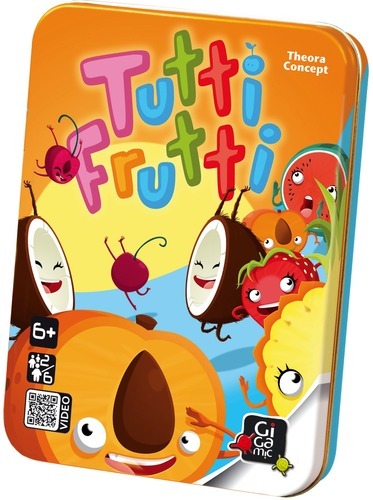 Tutti Frutti is a frenetic game that can often be played in less time than it takes to explain it! (This review won’t take much longer than that either!) The game itself is made up of 48 Fruit tiles which are double sided. 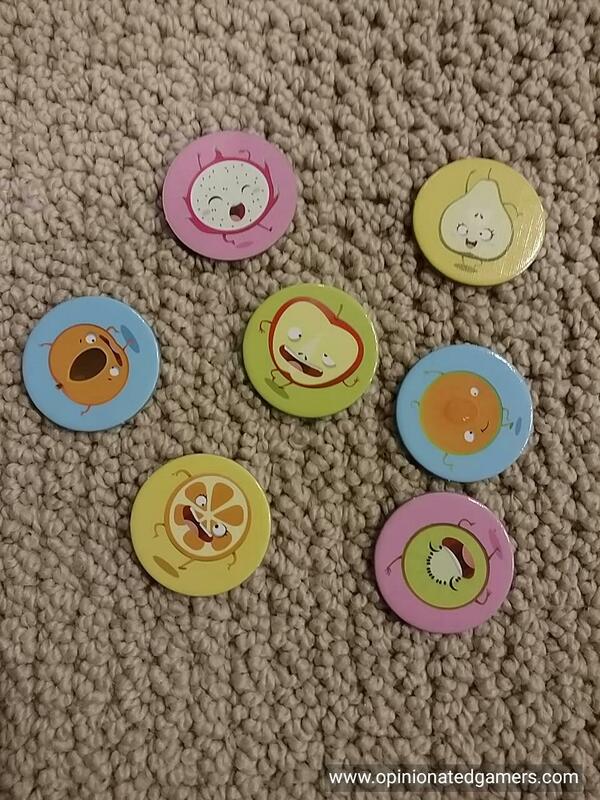 There are sixteen different fruit varieties in the game, and each of them is found six times on the tiles. The bunch of tiles is dumped out on the table and organized so that none of them overlap each other and that all of them are within reach of all players. When the game starts, each player takes a tile from the board and quickly looks at both sides of the tile. The goal is to now find a matching fruit to either of the fruits depicted on his starting tile. The new tile is picked up and then placed next to the start tile so that the matching tiles are touching each other. Your goal is now to pick up a tile which has a matching fruit to one of the exposed fruits on either end of your stack. All players are doing the same thing simultaneously, so you have to be quick to pick up the fruit you need when you see it. The tiles are double sided, so you may not see the fruit that you need immediately. You are free to flip over any of the tiles on the table to see what is on the other side. This is a super frenetic game with hands flying all over the table in the rapid fire search to find fruits on the table. Most of our games have taken about 3-4 minutes for the tile acquisition part of the game. As we are spreading out the discs on the table, we have made a house rule where the players each start by taking a tile into their hands without looking at it, and they only get to see what’s on it when the game begins. By doing this, all players get an equal starting position. We have played this with some younger children, and to be honest with you, age and experience do not seem to give much of an advantage. Maybe it’s just that smaller fingers can pick up the tiles faster or something, but our seven and eight year old cousins have been able to give us a run for our money with this one. This is obviously not the sort of game that I’d base my game night around, but it’s the perfect sort of thing for a family get-together, some downtime between soccer matches, or for a slumber party. The game comes in a nice tin, and the rules have eighteen different language translations – so you’ll probably be able to play it with whomever you run across. The tiles themselves are language independent, and to be honest with you, though I’ve not tried to do so – I bet that you could teach someone the rules to the game with pantomimes in under a minute! Dale Yu is the Editor of the Opinionated Gamers. He can occasionally be found working as a volunteer administrator for BoardGameGeek, and he previously wrote for BoardGame News.